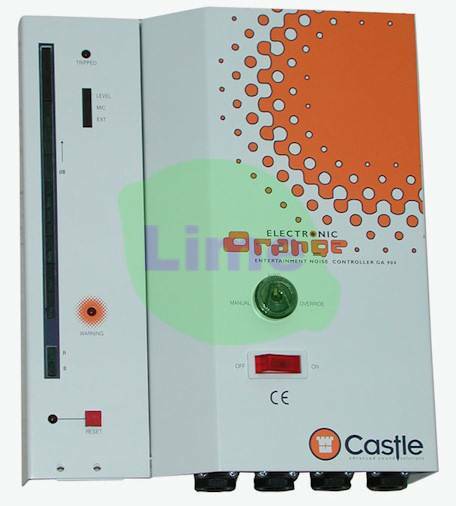 The Castle Electronic Orange Noise Controller is connected to the main power supply for the amplification equipment, the Electronic Orange flashes a warning when pre set sound levels are exceeded. If the operator fails to reduce the volume within a preset time, an automatic cut off activates. The music never has to stop, because the Electronic Orange flashes warning light if the limit is exceeded, and only when this is ignored does the power supply cut off to prevent further abuse. POWER SWITCHING : 240v 30A load or external contacter. Manual: Tripped unit must be manually reset. Auto: Tripped unit automatically resets after trip time. Override: Power output is maintained even during trip condition. Manual, Auto and Override are key switch selectable. Bar Graph display showing sound pressure level. Trip indication LED’s showing source. Short circuit protected Power ±12v, 0V Power for accessories.